To mark its 40th season, the celebrated San Francisco vocal new music ensemble Volti releases premiere recordings of works of dazzling range and diversity by five American composers — Robin Estrada, Tonia Ko, Žibuoklė Martinaitytė, Forrest Pierce and Mark Winges. Four of the works are among the twenty Volti has commissioned since 2013. Cover artwork is by Volti tenor Jacob Thompson. The CD will be released April 26, 2019 on the innova label, distributed by Naxos. It will be available through the innova website and the Volti website, as well as iTunes, Amazon, and retail outlets. Gary Snyder’s poem “A Prayer to the Great Family” provides the text for Forrest Pierce’s lush and luminous Gratitude Sutra, in which Snyder’s words of simple gratitude become, according to Pierce, “a discourse on the generous beauties that sustain us on this voyage around the sun.” The piece was commissioned by the Barlow Endowment for Music Composition at Brigham Young University for Volti, the BBC Singers, and the Latvian Radio Choir. Next up is From Ivory Depths, Tonia Ko’s evocative and inventive setting of fragments of text from a short story by Virginia Woolf. Ko, the recipient of many awards including a Guggenheim fellowship, wrote this work under Volti’s 2016 Choral Arts Laboratory commission, a competition for American composers under age 35. Robin Estrada melds Western forms with Southeast Asian musical styles in Cæli Enarrant, written as a reflection on the current conflict-filled socio-political climate. Centering the piece on the Golden Rule as articulated in the gospel of St. Matthew, the composer hopes the work will serve as a mantra, inspiring people to treat others as they themselves would want to be treated. Mark Winges, who has been Volti’s resident composer since 1990, contributes All Night, setting the poetry of Gustaf Sobin, language that the composer finds “rich, dense, and sparse, all at the same time—absolutely gripping.” The closing piece is The Blue of Distance, by Lithuanian-born composer Žibuoklė Martinaitytė. The textless, atmospheric work was inspired by Rebecca Solnit’s book A Field Guide to Getting Lost, which also provided the title of this recording. “The world is blue at its edges and in its depths… that color of horizons, of remote mountain ranges, of anything far away. The color of that distance is the color of an emotion, the color of solitude and of desire, the color of there seen from here, the color of where you are not. From A Field Guide to Getting Lost, © 2005 Rebecca Solnit. Reprinted with the permission of the author. Listening to Volti sing these remarkable new pieces is like visiting a contemporary art gallery – stimulation for the mind, the imagination, and the heart. 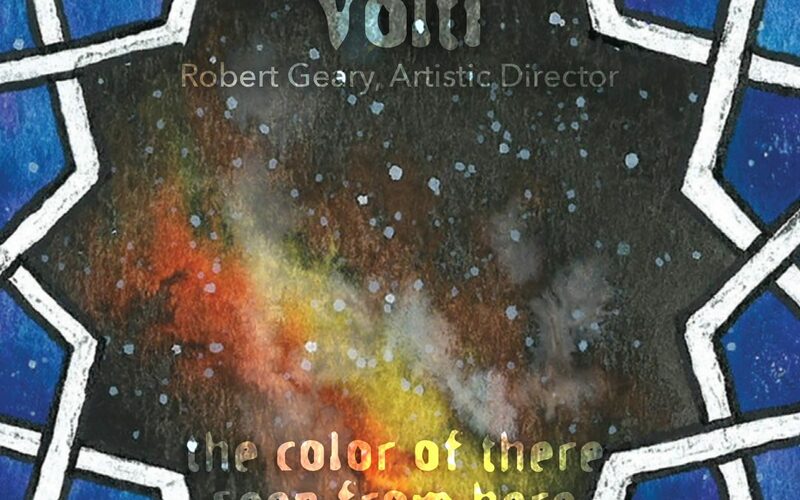 Volti’s professional singers, under the direction of Robert Geary, are national leaders in the discovery, creation and performance of new vocal music. Founded by Geary in 1979, the group ranges from 16 to 24 singers. In addition to producing concerts and recordings, and collaborating with groups including the Kronos Quartet and the Left Coast Chamber Ensemble, they are the only vocal group ever to have won the Chorus America/ASCAP Award for Adventurous Programming of Contemporary Music seven times. Recent projects include the Bay Area premiere of John Luther Adams’ Beyond Ocean, the premiere of Jimmy Lopez’s Dreamers under the baton of Esa-Pekka Salonen, and an extended collaboration with ODC/Dance performing Joby Talbot’s monumental Path of Miracles, choreographed by KT Nelson. Subscribe to our 40th Season!